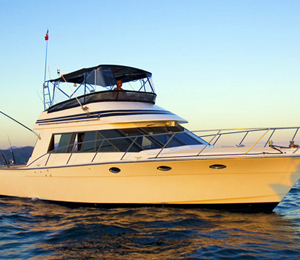 Holds up to 12 anglers and up to 15 pax on Cruising trips. Powered by Twin Diesel Engines, cruises at 14 knots. Master & Guest Stateroom with double Island Bed & Fillers. Air-Conditioning & Heating System for Cabins and Cockpit. Full Down Galley and Kitchen with Bar. Wide Saloon (153 sq ft) with Entertainment System: TV and (IPod ready)Stereo. Wide Bow for Casting and Sunbathing. Upper Full Electronics Helm Station. Spacious Fly bridge with seating for 6 adults. State of the Art Fishing Tackle, Telescopic Outriggers, Downrigger and Live well. Snorkeling & Scuba Diving Equipment are also available. I have been to the Bahamas many times, but Bertram 46 is one of my favorite trips! It includes everything that everyone should do here. As a Bahamas veteran, I can say only the best about this experience!